2010 - Humanities IDEAS: Inclusion Diversity Equality Acceptance Solidarity For All Humanity ! The strong bond of Parker Brotherhood continues between my Nephews, as proudly displayed at the parkerbrothersmusic's Channel, in this rendition of their acoustic debut of Katy Perry's song "Firework". Congratulations, you have just received a Congressional paid vacation! You are number 14 million among the 14.6 million (9.5%) who are already benefiting from this packaged deal in the United States. Gather your Family and Friends, dig out those fishing poles, load up the camping gear, put a few beers on ice; because you are about to embark on an adventure of a life time! Well, that’s what some Congress and Public figures think the unemployed are doing. We’re just kicking back, relaxing, perhaps playing games online. They’re partially right! 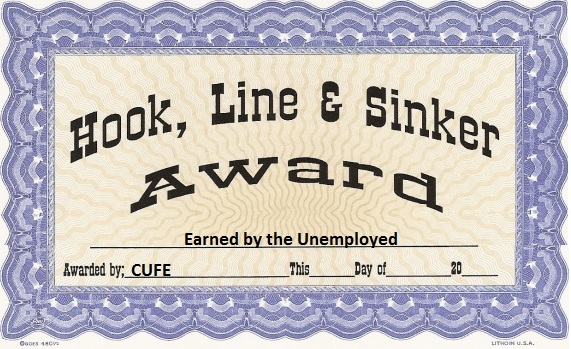 Heck there use to be cabin fever, now there is an epidemic of CUFE fever. The unemployed gather around the internet to surf the job banks. Using only the most superb resume for bait, we cast lines of our personal information out into the vast World Wide Web; all in hopes of reeling in that big catch of the day, a JOB! 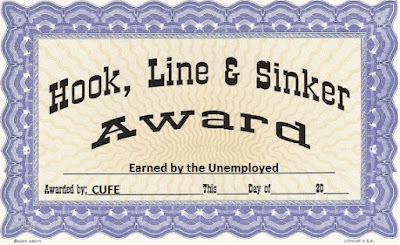 Our local Congress has been nice enough to set up a mandatory fishing spot for the unemployed, South Carolina JobLink. Perhaps our tax money at work, securing employment for those fortunate enough to be employed there: “You register for work just one time and you must do it within two weeks of filing your initial ‘unemployment’claim. If you don’t, you won’t receive an ‘unemployment’ check. ATTN: SCESC (South Carolina Employment Securities Commission), here is why I have only had one job referral from this required fishing spot: Let’s just disregard the fact that initially, South Carolina JobLink looked like someone’s bad attempt at learning HTML. Much of your information saved here wouldn’t be there when you next logged in. Therefore; you needed to frequently re-enter your info. As if we aren’t busy enough, looking for a JOB! Additionally; there consisted of many broken links. At most; job banks such as Monster.com, Indeed.com, HotJobs... require that you have a fishing license. Create a user account with a username and password. Not a problem; just another 15 or 20 minutes out of my day, when I could be FISHING. I’ll just add such and such to my growing list of already 50 job related accounts, consisting of 50 different usernames and passwords. No I’m not telling a whopper here, over 50 and still growing. Now copy/paste my personal information, fill in additional information here. Upload my resume. Start fishing! Click job, send resume, job applied for. Next, resume sent/job applied for. Oh the fish are jumping here! Wait, looks like another good job opportunity; click link, send resume…. NO! Welcome to the all time great time consuming, bait and switch! Please click here to go to their website and apply for this job. Click. In order to apply for this job, you must create a username and password. Number 51 and still growing -:) Another 20 minutes, done! Now, click on the job link. This part of the application consists of 130+ questions and may take 60 minutes. Having done these approximately 25 different times for various online applications, please note that I am simply crazy about this part of the CUFE! For those new to these fishing waters, during the next 60 minutes of your life, whatever you do; don’t nod off, pay close attention because if you hit the wrong answer by mistake – there is no going back, hope your internet server stays online, and pray like hell that your computer doesn’t crash. Admittedly; I did find particular humor in one major corporation application. After completing the required 60 minutes tedious psychologically probing 130+ questionnaire; I was directed to click a link to take an online confidential drug test. Heck, except for my blood type, I’ve already given out all my personal information to any and everyone, including possible scammers and spammers. So why not do a piss test too. In fact; I was looking forward to finding out where the virtual pee cup was and how modern technology could obtain this online sample. Needless to say; I was disappointed to learn, this was just another 20+ questions consisting of: Do you take drugs on Monday, Tuesday, Wednesday, Thursday, Friday? Do you take drugs on Saturday or Sunday? Do you take drugs before work? After work? etc. Notably; modern technology has also robbed the unemployed of the opportunity to be seen. A greet and handshake has been replace with ‘please apply online, fax, or e-mail your resume’. Even the days of fancy resume paper possibly capturing a potential Employer’s eyes has been replaced with online, black on white boring text. Temporary Employment Agencies seem like a last resort life preserver. I have personally visited two Temporary Agencies, only to be told; ‘apply online’. Yet, some Congress Members and Public figures, even tv show icons such as Judge Pirro, Judge Judy dare ask why more people aren’t employed, when there are jobs out here. Hello, we are busy answering questions! We’re busy logging in/logging out, creating users accounts, filling in, copy/pasting, uploading… Simply put, we’ve gone fishing! CUFE fever Baby! How far we've come, COVER, by Dirk Parker and Bennie Parker with Matt Holmes on guitar. Stake talent show in WIlmington NC, Jan 16, 2010. My Nephews Bennie and Dirk with Matt Holmes! Lean on me, COVER by Dirk Parker and Bennie Parker with Matt Holmes on guitar. Stake talent show Wilmington NC, Jan 16, 2010. My Nephews Dirk and Bennie with Matt Holmes!